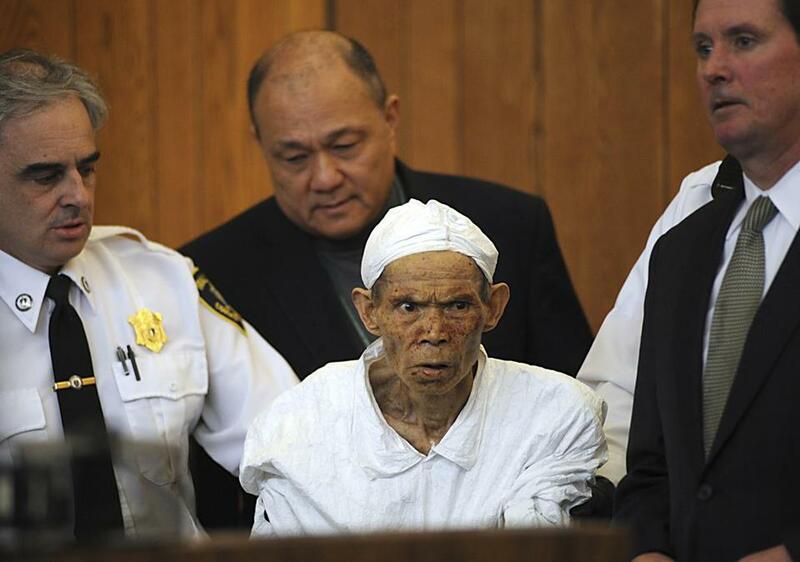 Jieming Liu, 79, appeared for arraignment in Westborough District Court on Friday. WESTBOROUGH -- An elderly man accused of murdering his wife suffers from dementia, and left a gruesome scene behind in the couple’s Shrewsbury home on Thursday, officials said today. Zhou’s husband, Jieming Liu, was found sitting passively in a rocking chair with blood on his mouth, face, hands, and clothes, and “what appeared to be pieces of flesh and body about the floor’’ near him, Worcester District Attorney Joseph Early Jr. said today. Authorities said the husband may have been eating the flesh of his wife. Early said police also found severed fingers, as well as bloodstains throughout the condo. According to Early, the couple moved to the US from China’s Hunan Province six months ago. Early, who was in court today, said it was clear to him that Liu suffers from dementia. The couple’s son, who discovered the horrific killing, told authorities his father is afflicted with Alzheimer’s disease. Early said the woman had “expressed concern in the past that she was worried” about her husband, but the district attorney said no restraining orders were issued, and police had not been called to the unit before Thursday. According to a Shrewsbury police report filed in court, the couple’s son checked on his elderly parents every day around 4:30 p.m. It was during his visit Thursday that he found his mother dead. His blood-soaked father repeatedly told him that the dead woman was not the person he thought she was, the police report said. “This is not your mother,” Liu kept telling his son, identified by police as Yening Zhou. The 79-year-old Liu was arrested Thursday and appeared today in Westborough District Court, where a not guilty plea to first-degree murder, mayhem, and assault and battery was entered on his behalf. Lui, who wore a white suit police usually wear at crime scenes and a white cap on his head, appeared incoherent during the proceeding. A slightly built, short man, Liu moaned loudly, and seemed unsteady on his feet and was weaving back and forth in the prisoner’s dock. A Mandarin-speaking translator stood next to him, telling him in his native language what was being said. But Liu appeared to take little notice of the translator, his attorney, Michael Hussey, the judge, or anyone else in the courtroom. Lui was ordered to undergo a mental competency evaluation at Bridgewater State Hospital. Hussey spoke with reporters outside the courthouse.